Mandy Bunnell, with caterer JW Steakhouse, sets out salads for Sunday night’s dinner at the new Ingalls Harbor pavilion. Participants in the 28th Annual NAIA Women's Soccer National Championship finals at the Jack Allen Recreation Complex in Decatur attend the tournament's opening ceremonies Sunday night at the new Ingalls Harbor pavilion. 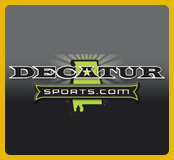 Some 600 officials, coaches and players from 16 teams from 13 states were the first official guests at the new Decatur facility. The $3 million Ingalls Harbor pavilion, Decatur’s largest event space, opened Sunday night for the opening ceremony for the NAIA women’s soccer tournament. Officials and attendees praised the new, 25,000-square-foot facility, saying its debut was a success and the only problems they noticed were minor. “Everything went well. There was lots of room for everybody. It’s a great facility for Decatur,” said Mayor Don Stanford following the ceremony. “Everybody seems happy,” said Tami Reist, president of the Decatur-Morgan County Convention and Visitors Bureau, as young women climbed on the hearths of the massive fireplaces at each end of the building to snap team pictures. The mantles above the stone fireplaces were draped with greenery, and the fireplaces were filled with candles. Others posed in front of a Christmas tree erected at the facility’s main entrance. The nearly 600 players and coaches from teams across the country are in town competing for the women’s NAIA national soccer championship. Games begin today at the Jack Allen Recreation Complex and end Saturday. The chilly downpour outside did little to dampen the spirits of the 16 college soccer teams gathered for the event, though some rain did find its way into the pavilion. “We noticed, with the rain, that we’ve got a few little leaks we’ve got to work on,” Reist said. Reist also said some sound issues need to be addressed, though it was not immediately clear whether it was the acoustics of the room or components of the sound system that resulted in pronouncements from the stage being somewhat muffled and monotone. Despite the bad weather, retractable doors kept the climate inside the open-air building pleasant. Most of the players who brought jackets left them draped on the backs of their chairs during the hour-long ceremony. Both Reist and Stanford upwardly revised estimates on how many people the 1,200-seat facility can hold after seeing the amount of space left between tables. “I think you could probably get 1,700 people in here if you get rid of the stage,” Reist said. She said the building was designed so the stage can be rolled in and out. “It’s very spacious,” said Nicole Mason of Houghton College in New York. The pavilion’s next booking is Decatur General Hospital’s annual Gala on Dec. 10. The facility belongs to the city, having been financed by borrowing $2 million from reserves and $1.6 million from the Morgan County Commission’s Regional Landfill fund. The Hospitality Association will repay the loans over 15 years using revenue from its $2-per-night tax on local hotel stays. The pavilion’s completion date had to be pushed back twice, from September to October and then from October to November. 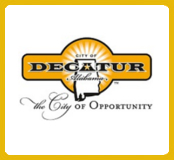 The cost also jumped by nearly $40,000 but was covered by a clause providing $250,000 for unforeseen expenses in the city’s contract with Decatur construction firm Fite Building Co. Parks and Recreation Director Jeff Dunlap said $115,000 was left over in the project’s budget and was put toward additional landscaping. Today — 11 a.m., 1:30 p.m., 4 p.m. and 6:30 p.m.
Tuesday — 11 a.m., 1:30 p.m., 4 p.m. and 6:30 p.m.
Wednesday — 11 a.m., 1:30 p.m., 4 p.m. and 6:30 p.m.
Friday — 1:30 p.m. and 4 p.m. Admission is free. 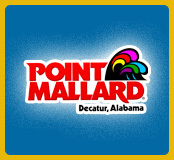 Parking is $10 a day per car and $20 a day per bus or an all-tournament pass is available for $30 per car or $60 per bus. Parking passes will be available at the complex entrance. For more information see naia.org.